Hmmm…it seems I am a bit obsessed with spots right now. I will have to try something new for my next project, although I do have some pretty blue and cream spot fabric that is calling to me from my stash! 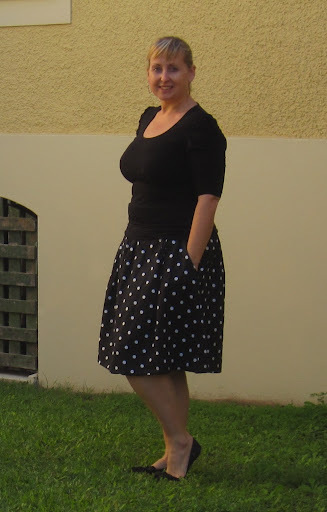 This skirt is Simplicity 2698, it is so comfortable and the fit is really good – I am very happy with it and didn’t have to alter the pattern much at all. Although I think it is sized a bit big, I cut out the size that lined up with my measurements and had to take a couple of inches out of the waistband (not my skinniest point normally). I will cut out a smaller size next time. 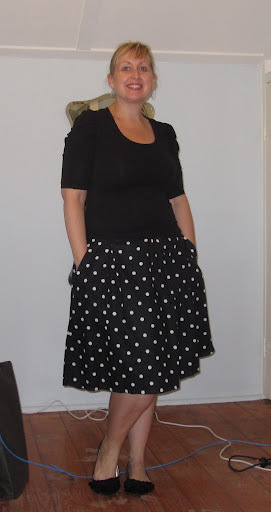 Love your polka dot skirt.. Looks great on you. Happy sewing. That skirt looks great on you well done. I like that pattern I have sewn it before and loved it. Very flattering. Thanks for the nice comments! It is such a fun skirt to wear, it makes me feel happy and girly.